"My husband says this dish is restaurant quality. It can be made ahead and kept in the refrigerator overnight. Very filling and great served with a salad and garlic bread." In a large bowl, combine ricotta, spinach, onion and egg. Season with parsley, pepper and garlic powder. Mix in 1 cup mozzarella and 1/4 cup Parmesan. In a separate bowl, stir together spaghetti sauce and water. Spread 1 cup sauce in the bottom of a 9x13 inch baking dish. 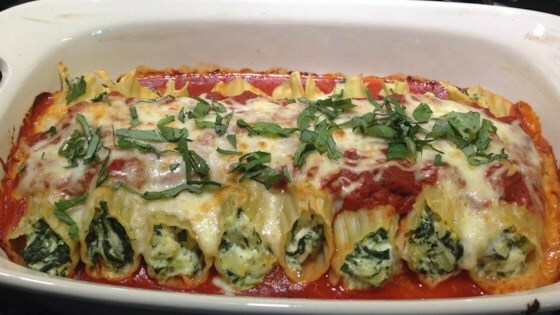 Stuff uncooked manicotti shells with ricotta mixture, and arrange in a single layer in the dish. Cover with remaining sauce. Sprinkle with remaining mozzarella and Parmesan. If refrigerating overnight, do so after step 3. Remove from the refrigerator 30 minutes before baking. It was good, but nothing spectacular. I did not add the water, and had it in the oven for five minutes longer than called for. It turned out perfect. Very tasty! !